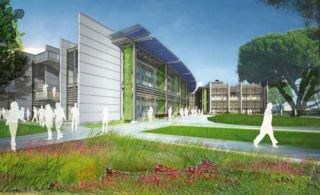 An illustration of the planned Sustainability Base at NASA's Ames Research Center in California, which will be the agency's most environmentally-friendly building. One of NASA's most ambitious new projects isn't in space,but on the ground. The agency is planning to build its most environmentally-friendlybuilding at its Ames Research Center in Moffett Field, Calif. The structure, tobe called SustainabilityBase, will likely be the"greenest" building in the federal government, said Steve Zornetzer,Associate Center Director at NASA Ames. The ceremonial groundbreaking on the $20.6 million buildingis set for Aug. 25, and construction is expected to be complete around November2011. The name for the new facility is an homage to the TranquilityBase from the Apollo 11 moon landing of July 20, 1969, when NASA astronautsNeil Armstrong and Buzz Aldrin became the first humans to land and walk on thelunar surface. NASA celebrated the 40th anniversary of the historic Apollo 11flight last month. "The very first image of this blue orb that we callEarth came from NASA," Zornetzer said. "When the Apollo astronautslooked back and saw the Earth?it was such an astounding image that it's reallyserved as almost a touchstone for the whole environmental movement." Utilizing solar panels, fuel cells, water recycling systems,and even technology derived from NASA's human and robotic spaceexploration missions, the building will aim for a LEED (Leadership inEnergy and Environmental Design) platinum plus certification. Sustainability Base is designed to consume no net energy -in other words, it will power itself. And compared to conventional buildings ofequal size, it will use 90 percent less potable water. "I decided that if we're going to build an energyefficient building, why don?t we build the most energy efficient buildingwe can possibly build, in the spirit of what we need to do for this country,"Zornetzer told SPACE.com. The centerpiece of the building's cutting-edge technology isits intelligent control system, which is based on ones originally developed forNASA spacecraft. A computer inside Sustainability Base will connect to the Internetto call up weather forecasts for the local area to help it plan environmental control.It will have access to electronic calendars of workers in the building, so itcan predict how many people will be at a given meeting, and adjust heating andcooling systems appropriately. Instead of air conditioning, Sustainability Base is designedto cool itself from geothermal wells that route naturally cooled water fromunderneath the ground through pipes and cooling panels inside the building. The computer will also control the windows, so when a chillnighttime breeze flows near, the building can take advantage of it too. NASA also plans to encourage occupants to try to improvetheir own levels of energy efficiency, which the building will keep track ofand report to people on their laptops. "We want people in the building to compete, to try tooptimize their own energy efficiency so they can get the greatest amount ofwork done with the least amount of watts," Zornetzer said. Sustainability Base will serve mainly as an office building,but may also house some scientific research and engineering. The cost of the building will be provided by a NASA programcalled Renovation by Replacement, which aims to replace antiquated facilitieswith more modern, energy efficient ones. The building was designed by the AECOMand William McDonough + Partners architectural firms. Swinerton Inc. will carryout the construction.